Always nice to have an uptempo track to get us through the weekend, especially an extended Easter weekend! 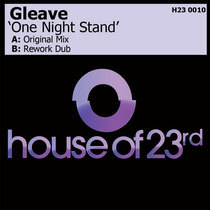 This track, ‘One Night Stand’, comes courtesy of Northern Ireland’s Gleave, the man from Larne who has been one of the key players in the region’s club scene, having been resident at many of its key clubs over the years, including one of our favs, Thompsons Garage. ‘One Night Stand’ is a lovely slice of music, which we would best describe as a mix of Anjuna Deep and and the purer side of Avicii, which is no bad thing in our eyes. The track speeds along, embracing you with its energy and as it hits the breakdown, a solo piano drops, capturing you in the moment before it’s joined by the track’s only vocal parts. This is nice and a great tune for the weekend ahead. Have a listen to the Soundcloud below, it’s out 16th April.